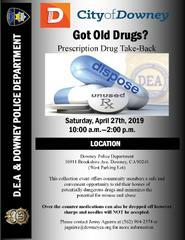 The Downey Police Department Plans to ‘Take-Back’ Unused and Unwanted Prescription Drugs on Saturday, April 27th, 2019. The Downey Police Department and community volunteers will be collecting unused, unwanted or out-of-date prescription medications during its semi-annual “Drug Take Back” event. This event offers community members an opportunity to rid their homes of potentially dangerous drugs and minimize the possibility of their misuse and abuse. The collection event will take place on Saturday, April 27th from 10:00 AM to 2:00 PM in the west parking lot of the Downey Police Department, located at 10911 Brookshire Ave. The event will be held rain or shine. Event attendees will have the opportunity to drop off their prescription medications into collection boxes provided by the Federal Drug Enforcement Agency (D.E.A). Over-the-counter medications can also be discarded. Liquids will only be accepted in fully sealed, unopened plastic containers. Needles, sharps, and glass containers will not be accepted. The event is co-sponsored by the Los Angeles Division of the D.E.A.